Side note: Have you ever used the website a.placebetween.us? Use it! It’s fun and super helpful. Houlihan’s was awesome – I was pleasantly surprised. Before going, I checked out the menu online. I was super excited to see that Houlihan’s offers martini flights for under $10! They looked delicious. 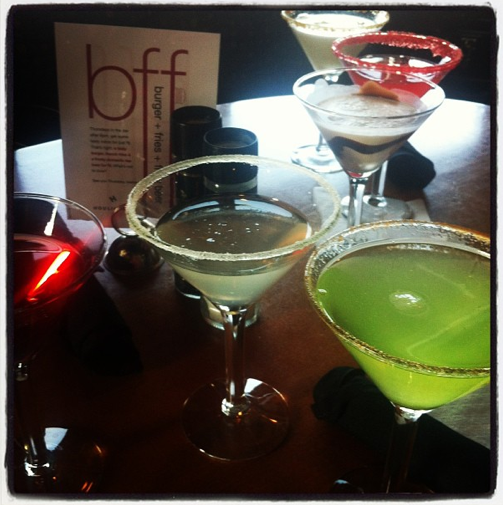 Two of us ordered the flights so we were able to try six different types of martinis including a cosmo, key lime pie, chocolate, Adam & Eve Apple, Lemon Drop and a fruity pink one with sugar around the rim. All of them were delicious! My faves were the Lemon Drop and Cosmo. Best part? They were out of flight glasses, so we got 3 regularly-sized martinis for only $9.25. Other specials included 2-for-1s on wine, beer and rails. 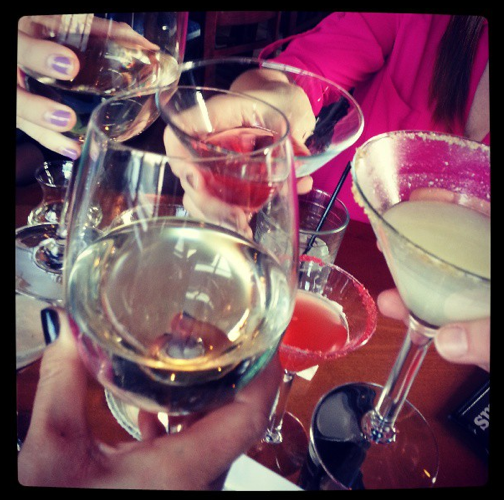 All of us girls agreed the drinks were delicious and the food was good so I definitely suggest heading over to Houlihans for Happy Hour.